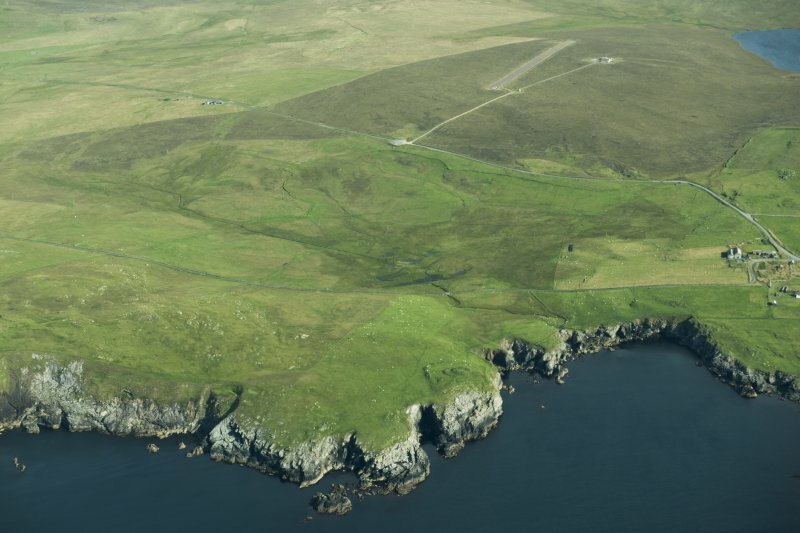 General oblique aerial view of Houbie Broch, Fetlar, looking N.
HU69SW 6 6200 9050 to 6262 9450. For comparanda, see HU15SE 20. 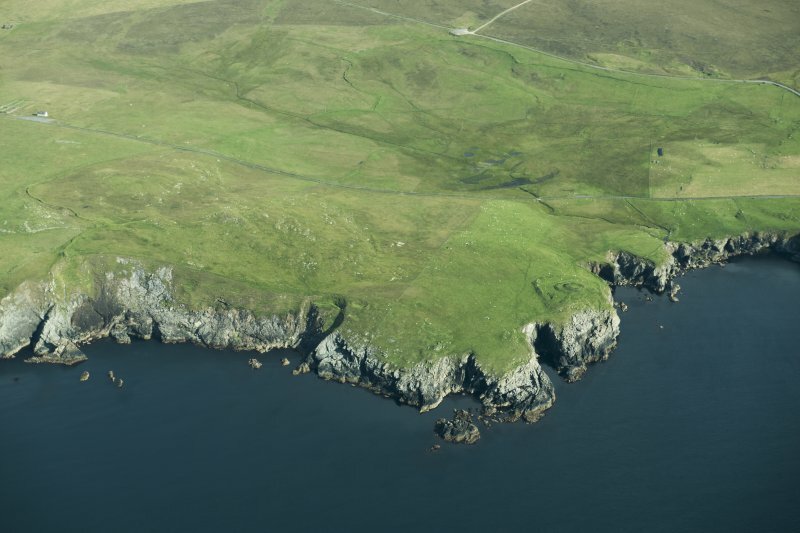 The Funzie Girt, Finnigirt, or, as it was formerly known, Finnigord - the Finns Dyke - divides the island of Fetlar into two approximately equal parts, and can still be traced for the greater part of its length, particularly towards the north end where the foundations are a conspicuous feature in an otherwise barren landscape. It is a dyke built of heavy local stones, the largest slabs or boulders being erected either on end or on edge to form the base. Originally its general thickness has been 3'. Its date and precise purpose are unknown, but a considerable degree of antiquity is suggested by its character as well as by its name and by the legends that are attached to it. Starting from the cliffs above Muckle Funziegord Geo on the north shore of the island the dyke follows an irregular course round the NW and west slopes of Vord Hill for a distance of fully a mile. Close to the middle of the west side of the enclosure, Whilsa Pund (HU69SW 5) with which it seems to be connected, it straggles and disappears. The continuation from the east side of Whilsa Pund is probably indicated by the foundations of a smaller dyke, which are the only remains of walling in the immediate neighbourhood. On leaving Whilsa Pund this smaller foundation trends first east and then south towards Haltadans (HU69SW 4), which it passes on the north at a distance of about 20'. It is lost on the moorland some 100yds farther to the south-west, but it may have continued to the north shore of Skutes Water. The true Funzie Girt emerges again at the south end of Skutes Water, and between the Riggin of Setter (HU 624 915) and Rivs Dale (HU 621 915) it is particularly well defined. 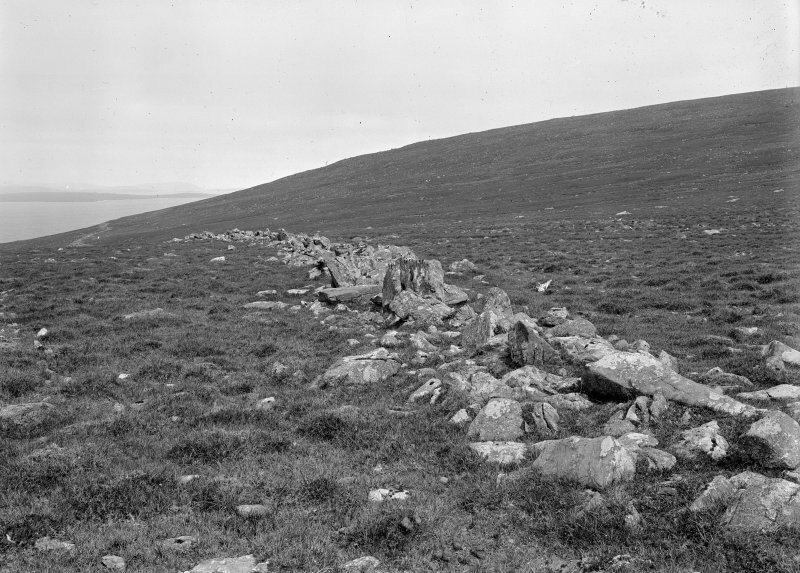 Within the township boundary at Houbie (HU 621 907) it has entirely disappeared, although one or two boulders set on edge at irregular intervals may possibly indicate its course. Locally it is believed to have crossed the arable land around the township in the direction of the Clemmels Geos (HU 620 905), where it ended at the edge of the cliffs. On the other hand, from the low ground of the Mires of Houbie (HU 618 908), a similar foundation runs over the Vallahamars (HU 616 904) towards the cliffs at Dammins (HU 617 903) opposite the Stack of Billaclett (HU 615 902), and this may have been the real terminal point on the south shore of the island. The name 'Funzie Girt' suggests this may have been simply a boundary dyke for the property of Funzie (HU 660 900). The remains of an old hill dike of indeterminate period. Local tradition asserts that it was built as a result of a disagreement by two landowners, & that it was "built overnight." Also known as Finnigirt, the old name was Finnigord, the Finns' dyke, and the various folk myths attached to it suggest that it was built in prehistoric times as a land division. It winds across from the Houbie area on the south coast to the cliffs of East Neep on the north coast, passing west of the summit of Yord Hill, and thus divides the island into two roughly equal parts. Its southern end is destroyed, but it is well preserved on the open moorland north of the modern airstrip and especially on the western and northern flanks of Yord Hill. It was built of large slabs and boulders set on end, and it was origina lly about a metre wide. At HU 618928 south of Yord Hill, there is a circle of large boulders known as Hjaltadans. The circle is about 11m in diameter, with a earthen circle within it and two upright stones at the centre. It is probably a burial place of the third millennium BC, and its design relates it to the Rounds of Tivla on Unst (see under no.68).